What with all this concern for political and faith issues, with sanctions, purging, punishments, elimination, dismissals and expulsions, it is good to remind ourselves that Hackney could teach the Houses of Parliament a thing or two. Here we are with a multitude of faiths, political loyalties and skin tones and best of all cooking, surviving in what our elders and betters have tried to turn into a hostile environment, but which we find a good place to be; not that cliché, a melting pot, more of a stir-fry, where each ingredient retains its identity and is enhanced by being part of a lively mix of flavours and texures, an explosion of harmony, not conflict. Here in Hackney the spring solstice is celebrated by many faiths and traditions. Gently out of sync, as usual, this column somehow managed to miss pancakes on Shrove Tuesday so above is a rather bleak image of poor folk in nothern Europe making the best of a few ingredients, flour, a precious egg, and milk or water, fried in lard or bacon fat, a bit crisp round the edges. In the past, much depended on the state of the larder, so although early spring brought blossoms and birdsong, there was often precious little left to eat. Food rituals concerned with the solstice are often to do with this fraught gap between the full larders of autumn and the plentiful harvests of summer, for winter was not all bad – peasant families could sit indoors, when the weather was too harsh for outside work, with enough firewood for a warm blaze, and eat well on all the preserved and dried and salted food prudently laid up during summer and autumn. Spring was the killer, when cupboards were bare, and the careful provisioning had been gobbled up imprudently in earlier months. No new shoots and roots yet to seek out and enjoy, and arduous outdoor work that had to be got on with made for poor health and deep depression. Many faiths and cultures have found comfort and support in celebrating the spring solstice or equinox by compensating for the gloom and misery still to come with a defiant last-ditch rush of greed and gluttony, Carnival or Cuccagna, before the routines of repentance, abstinence, punishment and forgiveness ushered in the renewal of life and hope that we celebrate at Easter. A binge followed by short-lived remorse and repentance and eventual rebirth can of course be a year-round event, not a seasonal one, but before and during Easter it acquires a heavy load of religious symbolism, along with the more down-to-earth implication that we might as well grab all the good things we can gobble up while they are still around, and pay for it later. 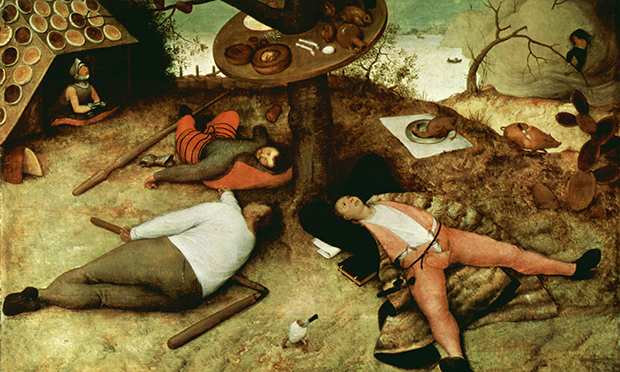 The image of ‘cockaigne’, a land where everyone could eat and drink their fill without having to lift a finger is a cheering compensation for the miseries of Lent. The myth of the well-stocked store cupboard presided over by the plump rosy-cheeked granny in her sprigged apron is one of the cornerstones of post-war Italian food writing, with all those luscious recipes – ‘La mia nonna faceva sempre così…’ (‘Granny always cooked it this way…’) – and fond memories of a plentiful past. Today a generation of clear-eyed young food historians is now exploding the grannies and picturesque food myths of dearth and plenty, and chronicling the horrible realities of hunger and disease, and the inequalties of food provision. Whatever the hardships, Easter was celebrated with special confectionary, often including eggs, immortalised in many still life paintings. 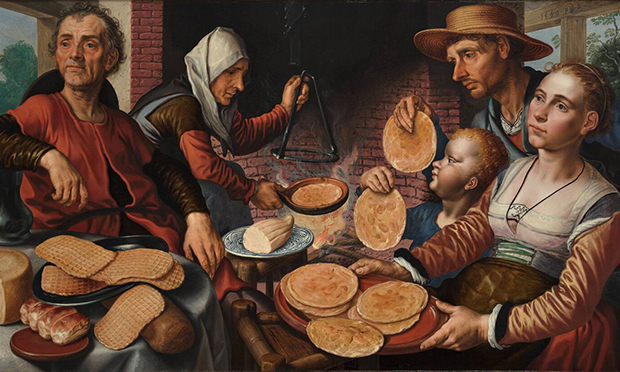 Josefa de Óbidos produced mawkishly sugary scenes of Baby Jesus and the Holy Family for ecclesiastical clients in 17th century Portugal, but her portrayal of the amazing variety of pastries and cakes made by nuns in convents has a crisp realism that is pure delight for food historians, whatever the symbolism behind the confectionary. 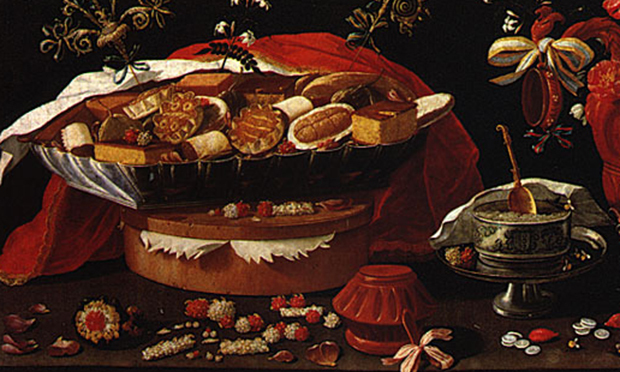 Those pastries were a nice little earner for the convents, where nuns with the necessary professional skills and patience concocted these hugely expensive sweetmeats. We do not know why Josefa painted so many still lifes of this sinfully rich confectionary, maybe for clients who were happy to display the range of luxeries that only the rich like themselves could afford, but they are a mouth-watering, tooth-twingeing, tribute to traditional skills that still flourish today. 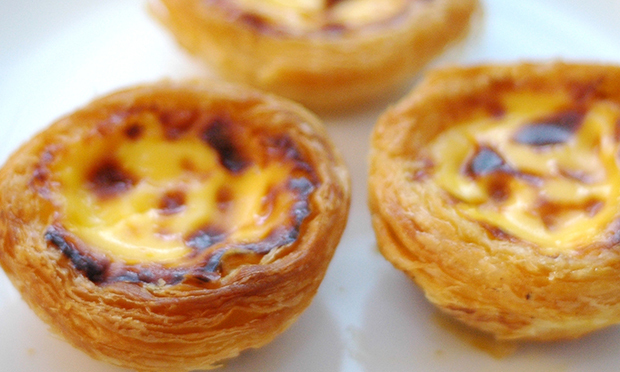 The much-loved Portuguese natas that were once a rarity in London, are now ubiquitous. We used to have to undertake the the arduous journey to Lisboa Patisserie in Golborne Road in Notting Hill to pig out on pastéis de nata, tiny little tarts, a couple of fragrant bites at the most, of a friable buttery pastry with a rich egg and vanilla custard filling, slightly caramelised in a hot oven, and eaten while still warm. Pastéis de nata can be found in many of Hackney’s bakeries. Now it seems as if every other posh bakery in Hackney has its natas, some stodgy, some brilliant. Spitalfields Market used be home to Taberna do Mercado’s excellent versions, and they flourish at the deli A Portuguese Love Affair in Hackney Road. The transition from Christmas Panettone to Easter Colomba is a welcome sight in Hackney’s Italian delis, where the vaguely dove-shaped cakes, light and fragrant with vanilla and spices, studded with candied fruit, are welcome once the last of the Christmas versions have gone. And at last the longed-for local asparagus and first shoots of wild garlic appear to drive away the winter blues.